Phil Plait (one of my favorite science bloggers) pointed out that yesterday marked the 25th Anniversary of this famous photograph. It’s a picture of Earth, taken by the Voyager 1 Spacecraft, from more than six billion kilometers away. The image inspired the passage. 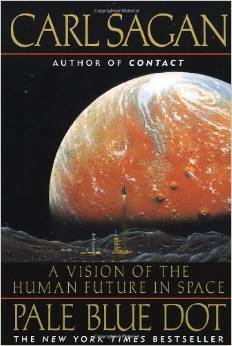 And the passage grew into its own book, Pale Blue Dot: A Vision of the Human Future in Space. I’ve been skimming it this morning, and it’s chock-full of graceful, elegant prose, and lively storytelling. We were wanderers from the beginning. We knew every stand of tree for a hundred miles. When the fruits or nuts were ripe, we were there. We followed the herds in their annual migrations. We rejoiced in fresh meat. Through stealth, feint, ambush and main force assault, a few of us accomplished together what many of us, each hunting alone, could not. We depended on one another. Making it on our own was as ludicrous to imagine as was settling down. 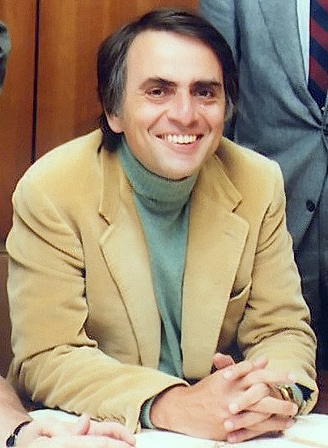 As Sagan points out, it was only in the last 10,000 years — a mere speck on the timeline of our existence — that we traded our wandering ways for a life more settled. We gave up hunting and gathering, and learned instead to plant, grow and harvest. The benefits of this shift were immediately obvious. For all of its material advantages, the sedentary life has left us edgy, unfulfilled. Even after 400 generations in villages and cities, we haven’t forgotten. The open road still softly calls, like a nearly forgotten song of childhood. We invest far off places with a certain romance. This appeal, I suspect has been meticulously crafted by natural selection as an essential element in our survival. Long summers, mild winters, rich harvests, plentiful game — none of them lasts forever. It is beyond our powers to predict the future. Catastrophic events have a way of sneaking up on us, of catching us unaware. Your own life, or your band’s, or even your species’ might owe itself to a restless few – drawn by a craving they can hardly understand or articulate, to undiscovered lands and new worlds. He then segues from this universal epic to something far more specific: his own family history, marked as it is by its own wanderings. His grandfather, who grew up in the Austro-Hungarian empire of the late 19th century, fled to the New World in 1904. According to family lore, he was evading a murder rap (the New York Times reports that he had killed an anti-semite). All of this is just the beginning, of course, just a snippet of the book’s opening chapter. The rest, as its title suggests, is devoted to the saga of space exploration. But we know a bit about where those other stories go from there. Chaiya has a daughter, who in turn has a son. The son is named Carl, after his grandmother. He goes on to become one of the most influential and beloved physicists of all time – both a space explorer and a Pulitzer-Prize winning writer. He inspires a generation of scientists (and non-scientists!) to think, and wonder, and explore — to marvel and delight in the mysteries of the universe. And humanity moves forward, too — out of a world shrouded in mystery, and into one that has been wholly mapped and catalogued (just about). The adventurers who crossed seas and planted flags give way to those who would map stars and chart galaxies and dream of colonizing new planets. And the rest of us continue wandering (many of us, anyway), either in search of refuge or to satisfy some primal urge. And all of those sagas — every last bit of every last one — are contained on that same pale blue dot, suspended in that sunbeam. PS — for a look at some of the Voyager 1’s other spectacular images, see Jason Major’s post, here.